> A Blood Test Can’t Detect Cancer, Can It? We began 2018 with some promising news on cancer: A simple blood test can now detect disease in eight common sites. Called the CancerSEEK test, it was developed at the Johns Hopkins Kimmel Cancer Center, and may herald a new age in cancer medicine. How should insurers react? Treating cancer earlier would mean many policyholders will live longer and healthier lives. Also a test like this could be useful in risk selection, but insurers of Trauma (Critical Illness) cover may be concerned their policy definitions could date more quickly. For now, a calm consideration of the facts is the best response for insurers. Early detection is key to successful treatment of cancer. Sampling blood to pinpoint circulating proteins and DNA from a developing tumour, as CancerSEEK does, could one day replace traditional mammography and colonoscopy screening or the “wait-and-see” approach to cancer detection. CancerSEEK claims to address the first three criteria reasonably well - for some cancers better than for others. To predict a cancer’s location, researchers trained a machine-learning algorithm, combining gender, biomarkers and the blood test result. The test itself is no mean feat. It evaluates the levels of eight proteins and the presence of mutations in 2,001 genomic positions. With an estimated cost below US$500 (and probably decreasing over time), the test may well be a good investment. The researchers followed 1,000 cancer patients without metastasis and before neo-adjuvant chemotherapy was given (i.e., drug treatment before surgical removal of a tumour). All were diagnosed with stage I to III cancer of either the ovary, liver, stomach, pancreas, oesophagous, colorectum, lung or breast. Taking Australia as an example, these sites made up almost half of all newly-diagnosed cancers in 2017, with similar numbers in other countries. The test sensitivity by cancer type is shown in Figure 1, sorted by the Australian incidence rates (from high to low). The detection rate varies from 33% in breast cancer to 98% in both ovarian and liver cancer. Rates were often lower in stage I cancer patients. 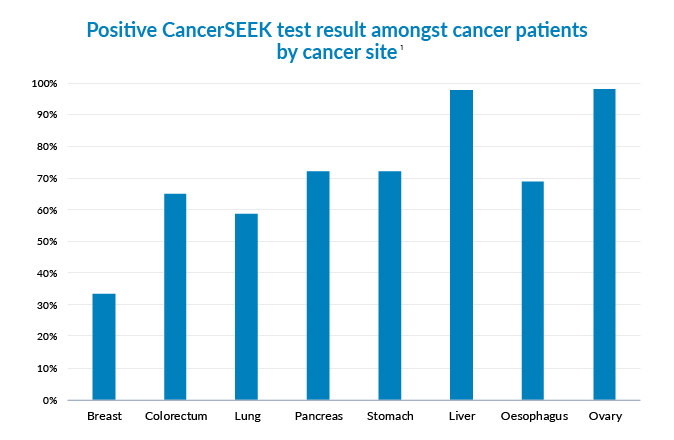 CancerSEEK is a more sensitive test for the less prevalent of the eight cancer sites. 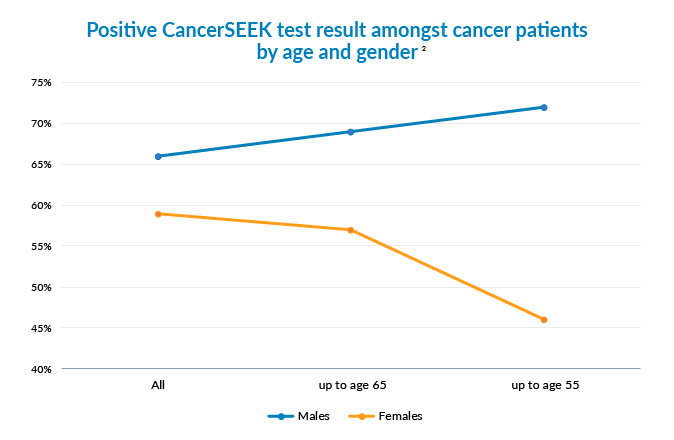 Because of the different sensitivity rates by cancer site it is not surprising to see that currently more men would benefit from this test and, in particular, younger men (Figure 2). Less than 1% of the healthy lives had a positive CancerSEEK test result. This suggests a high specificity but is no confirmation of it. The prediction model derived for the correct identification of the organ site also shows some promise. For a person with lung cancer the discovery rate was just under 40% (Figure 3) with the model predicting more often a colorectal cancer amongst these patients. However, for patients with ovarian, pancreatic or colorectal cancer the prediction rate was around 80%. 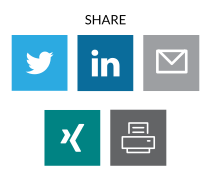 However, as promising as these research results may seem, limitations remain. In a true screening setting the patients would have less advanced disease development (the study population had known cancer and symptoms). Accordingly, the detection rate in a population cohort, say, all 55-year-olds, would be lower than reported in the study. The healthy lives in this study, in contrast, were selected. In a true screening setting some lives may have an inflammation or medical condition that may result in more false positives. While the study group was not small, it wasn’t large enough for a robust check of sensitivity and specificity. 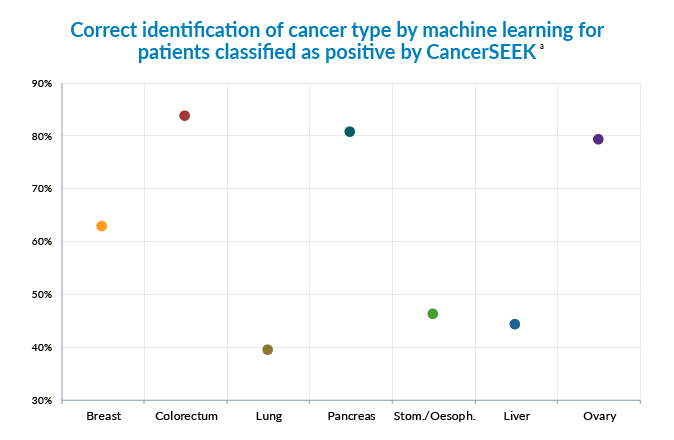 CancerSEEK is a way off from being an accurate, magical test to find cancer before it develops to a stage that can be diagnosed conventionally. It isn’t ready for use in population screening by health authorities. Larger clinical trials have begun, but results may take five years to emerge. 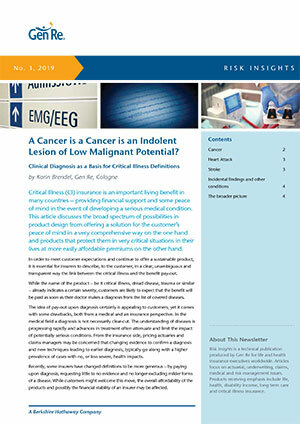 Insurers need not fear a sudden influx of cancer diagnoses amongst their customers, nor do they need to work out how to deal with a blood test result in place of the histopathological evidence mandated in almost all current cancer definitions. The news does show, however, how fast liquid biopsy technique has evolved and points to what will be possible in future. It is sure to spark a debate about over-diagnosis similar to the one that followed screening programmes that did not result in lower mortality rates - the ultimate success factor. As always it’s a mixed bag for life insurers. One takeaway is that offering a traditional Critical Illness product with a 100% pay-out upon diagnosis alone becomes increasingly unviable and unmanageable, even in markets where premium rates can be adjusted. The development is another broad hint that these types of products cover a spectrum of conditions and outcomes for each disease, and that the benefit levels they offer must reflect this reality. JD Cohen et al., Detection and localization of surgically researchable cancers with a multi-analyte blood test. 2018. Science, DOI: 10.1126/science.aar3247. Home > Knowledge > Blog > A Blood Test Can’t Detect Cancer, Can It?